This timely article is taken from the upcoming Bill Salus book called THE NEXT PROPHECIES. The NEXT PROPHECIES is the sequel to The NOW PROPHECIES book, which is an all-time bestseller at Prophecy Watchers. See our SPECIAL OFFER below this article. Ezekiel 38:5 lists Persia, renamed Iran in 1935, as a member of the Magog coalition that invades Israel in the latter days. The fifty-two verses in Ezekiel 38-39 provide some of the most literally descriptive predictions within the entire Bible. It identifies the invaders, their motives, their defeats, the Lord’s divine intervention and purposes and the sequence of aftermath events. The focus of this article is the identification of WHO IS and WHO IS NOT, part of Ezekiel 38-39. The Invaders: Magog, Meshech, Tubal, Persia, Ethiopia, Libya, Gomer, and Togarmah. 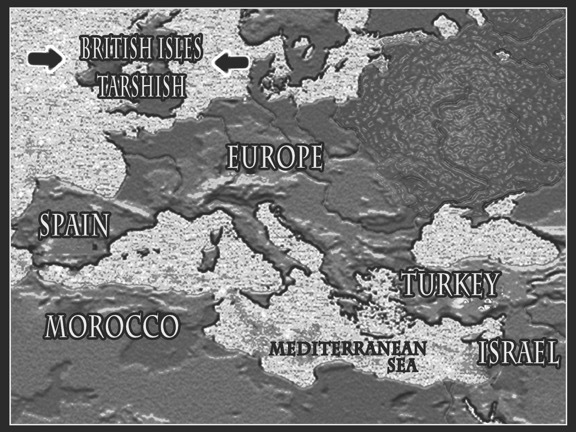 (Refer to the Ezekiel 38 map image to find out the consensus of the modern-day equivalents of the Magog coalition). The Protestors: Sheba, Dedan, the merchants of Tarshish and their Young Lions. The prophecy informs that, in the latter years the invaders will attack Israel to capture plunder and booty. They covet Israel’s economic prosperity and conspire militarily to confiscate this livelihood as part of their spoils of war. As the victor, the Lord, not the IDF or America, prevents this from occurring by utilizing supernatural means to defeat these invaders. These miraculous events are described in Ezekiel 38:18-39:6. Sheba: Yemen, where the Iranian proxies, the Houthis, exist today. Young Lions: Either the colonies that came from the UK, namely North America, or the offshoots of Spain, mainly the Latin American countries. (In my book entitled, The Now Prophecies, I explain why the “Tarshish” is likely the UK and their “Young Lions” seems to be America. Having identified WHO IS part of the action in Ezekiel 38-39, now let’s observe who appears to be MISSING IN ACTION (MIA). The emphasis is put upon Iran and its present proxies, who are, Hezbollah, Syria, Hamas and the Houthis. Iran also has a burgeoning presence within Iraq. The Houthis are busy helping Iran spread its hegemony throughout the Middle East. Some suspect the Houthis, who were given missiles by Iran, are testing the proficiency of these missiles, by using Saudi Arabia as a punching bag. The purpose in part, is to confirm that Hezbollah’s 150,000 Iranian provided missiles will be effective against a war with Israel. At the very least, it is observable that the Houthis in Yemen are currently enemies of the Saudis. Yet, in Ezekiel 38:13, we see that Yemen, as Sheba, and Saudi Arabia, as Dedan, are aligned together protesting Iran’s participation in the Magog invasion of Israel. The glaring question is: “Why is Yemen not included among the Magog invaders?” The probable answer is that something adverse happens to the Houthis before Ezekiel 38, that eliminates them as an effective proxy of Iran. Hezbollah is a major threat to Israel. Estimates are that they have about 150,000 advanced missiles pointed at a bank of strategic Israeli targets. Some analysts suspect that when Iran gives its Hezbollah proxy the green light to war against Israel, that with the amount of launchers they have, could launch 1000 missiles per day into the Jewish state. Yet, we see no resemblance of Hezbollah mentioned among the Ezekiel invaders. Hezbollah hails from Lebanon, and if they were part of the Ezekiel prophecy, they would likely be identified by the biblical names for Lebanon, which are Lebanon, Tyre, Sidon, or Gebal. None of these names are listed in Ezekiel 38, however, Tyre and Gebal are listed in the Psalm 83 prophecy. The question is: “Why isn’t Lebanon, Tyre, Sidon or Gebal listed alongside Persia in Ezekiel 38:1-6?” In his forty-eight chapters, Ezekiel refers to these places at least twenty times, but not even an honorable mention in Ezekiel 38-39. 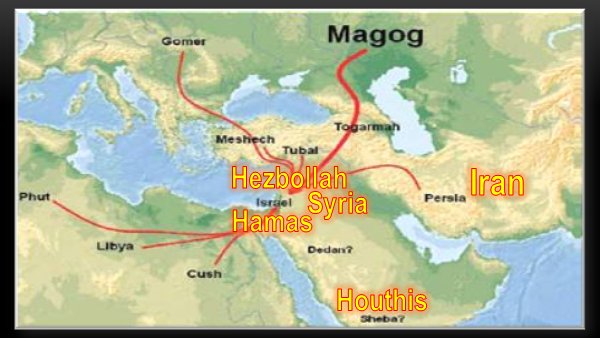 Additionally, perplexing is the fact that Ezekiel 38:15 and 39:2 specify that the Magog invaders attack from the North of Israel, which is the actual geographic location of Hezbollah in Lebanon. Perhaps like the Houthis, Hezbollah has something crippling happen to this terrorist group that eliminates it from the Magog invasion. Iran has been instrumental in supporting President Bashar al-Assad of Syria throughout the Syrian revolution. Yet, there is no mention of Syria, Assyria, Damascus, Hamath or Arpad among the Magog Invaders. These are the biblical names for modern-day Syria. Ezekiel alludes to these names at least twelve times in his forty-eight chapters, but not once in Ezekiel 38. However, Assyria shows up in the Psalm 83 prophecy. Damascus is destroyed in the prophecies within Isaiah 17, and Damascus, Hamath and Arpad are the subjects of Jeremiah 49:23-27. “Why isn’t Syria listed alongside Iran in Ezekiel 38?” Is it because Damascus gets destroyed in Isaiah 17 beforehand? As this Jerusalem Post headline points out, Hamas is another Iranian proxy terrorist group. Hamas is located in the ancient biblical lands of Philistia or Gaza among other names. Although Philistia is identified in Psalm 83:7, it is nowhere to be found in Ezekiel 38-39. “Why not?” Is it because Psalm 83 finds fulfillment prior to Ezekiel 38? Is that also why Hezbollah and Assyria are not part of Ezekiel 38? All three of these Iranian proxies today, were aligned together in the 3000-year old prophecy of Psalm 83. DOES PSALM 83 PRECEDE EZEKIEL 38? IS THAT WHY THESE IRANIAN PROXIES ARE MISSING IN ACTION IN THE EZEKIEL 38-39 PROPHECIES? 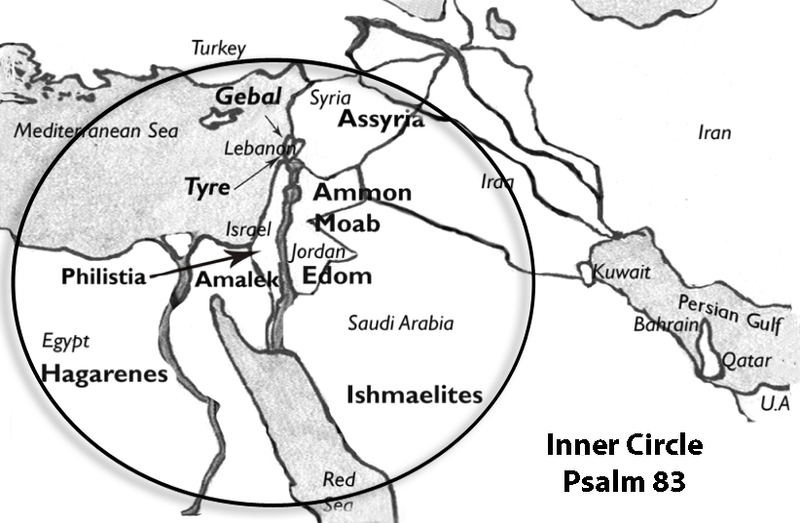 For more information about this possibility, read my article entitled, “Psalm 83 or Ezekiel 38, Which is the Next Middle East News Headline.” Below is a map of the Inner Circle of the Psalm 83 confederacy. These are Israel’s notorious enemies. 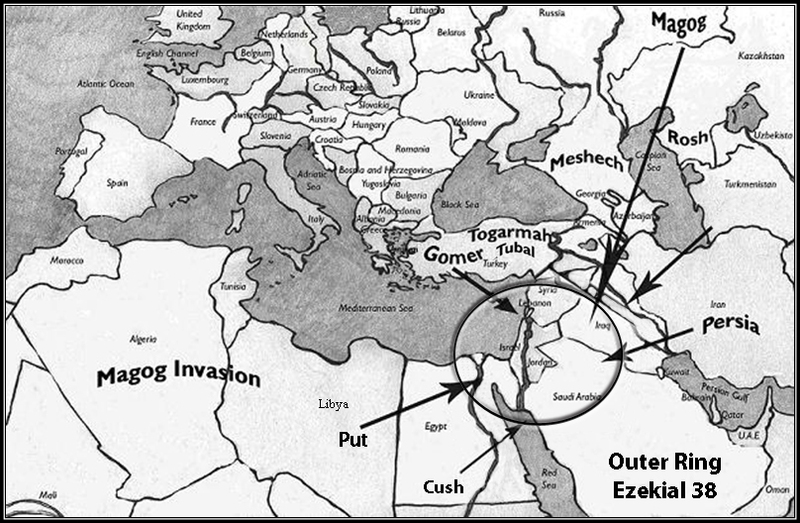 Compare this to the Outer Ring map of the Ezekiel 38 coalition, who have never been Israel’s historical enemies. Pre-order THE NEXT PROPHECIES book, which is due out September 15, 2018, and get a FREE Apocalypse Road book. Apocalypse Road, Revelation for the Final Generation is the novel version of THE NEXT PROPHECIES book. CLICK HERE to Pre-order THE NEXT PROPHECIES book. ***Pre-Sale*** – The Next Prophecies – New Book From Bill Salus – Buy 1 Get 1 FREE!